DJ Xris SMack! at CITY OF DARK ANGELS - "Heresy: Chapter VII : Unity"
"Heresy is a yearly City of Dark Angels Events since 2011. 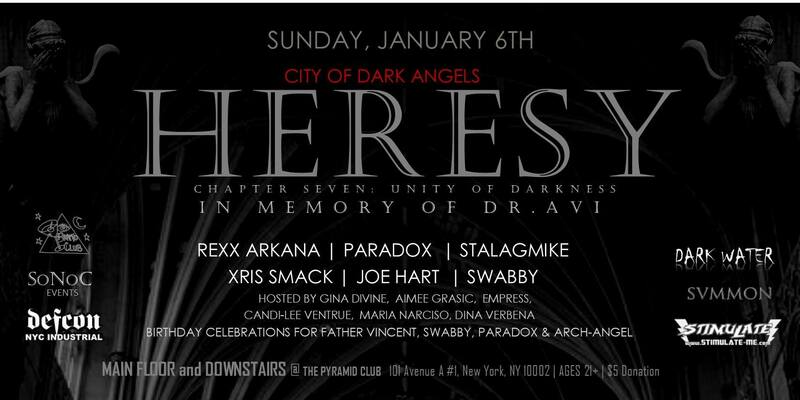 A time of unity for the entire NYC dark scene and winter birthday celebrations for some of our promoters and DJs. Dr. Avi was a special guest Dj for this particular night and many others. Avi not only Djed for us but also performed with the Industrial band Nekronet at one of our parties. Dr. Avi was a great promoter setting up concerts along with others at Rebel, Irving Plaza and Gramercy Theater. So we will be dedicating this party to his memory, the laughs, the great music and concerts he brought to us all. NO DRESS CODE, JUST BRING YOUR GOOD VIBES! We ask just for a minimum donation of $5 to cover for the expenses"
:Arch-Angel, City of Dark Angels, Industrial, Joe hart, Paradox, Rexx Arkana, Stalagmike, Swabby, Xris SMack!